A few months back, Gorgeous Cosmetics had a sale where if you bought makeup for $50, you got another $100 for free. Pretty sweet, I thought! I wasn’t gonna buy any more makeup at the time because I definitely had enough, but how could I resist? I thought it was a one time deal. Imagine my delight and surprise when I found out that they had the same sale on today! I DEFINITELY don’t need any more makeup this time around. But… How can I resist!? The lipstick is a perfect shade of red wine for those days when I feel extra femme fatale, and the red glitter on the left has almost been mine before (since the Captain owns it and we shared all our makeup I’ve owned it in spirit), so I know it’s absolutely amazing for a red glitter lip. All the other stuff is new to me, so I’m excited to play around with it! I am just not doing anything interesting in terms of makeup lately because I feel like I don’t have the time or inclination now that I’m travelling. It’s so much easier to just keep it simple and stick to the basics – not least of all because then I don’t have to cart all my makeup around everywhere! One thing I am doing, though, as part of my ongoing challenge to use absolutely all of my makeup, I decided to make a list of the makeup I own. I’m crossing everything off as I use it, and hopefully at the end I’ll have used it all, or be left with a list of products I might as well just get rid of. 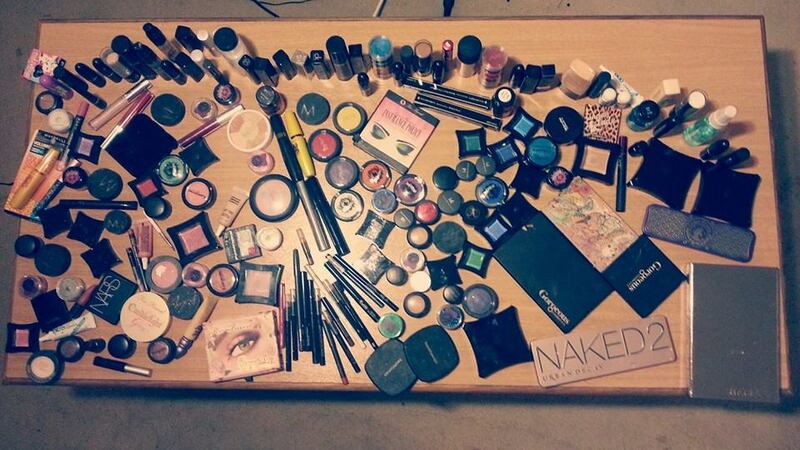 I love having a lot of makeup, but nothing makes me feel more cluttered than having stuff I have no use for! In my defense, only about half of this is mine. But still, half of a shitload is still quite a lot. I’m sick today, so I decided to have a lazy day – the only responsible thing I’m going to do today is dye my hair. I had my roots done yesterday which was such a relief – last time I did them I had a bit of a band of darker hair, so this time I asked her to fix that for me. I went back to the first hairdresser I went to in Australia – she was honestly the best I’ve been to, and not that expensive. Privé in Chadstone y’all! I always get a hairdresser to bleach my roots and then I just do the colour myself. I actually thought this fake ombré was pretty cute, which was why I didn’t do my colour yesterday. I thought I might go like that for a week but in the end, the pain of non-toned blonde was too great. I’m getting a bit sick of the blue, to be honest. I just like pink so much more! The only issue I have with pink is that I like to wear pink makeup and clothing, so sometimes it’s a bit much. Looking like a cartoon character is always nice, but sometimes you’re just too lazy to match your pinks exactly, and then it just looks sloppy. So when I’ve finished my bottle of blue dye I’m going back to lavender, which is pretty much the best candy floss compromise ever. 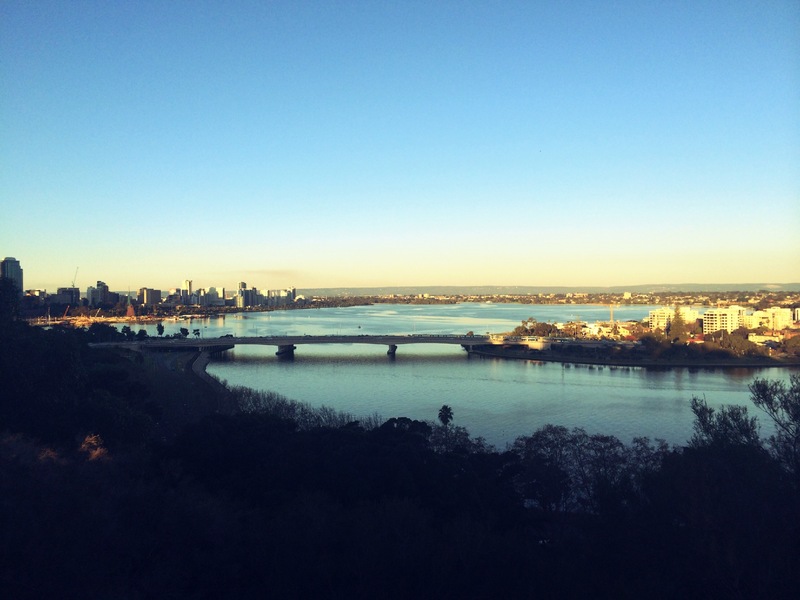 Yesterday, I abruptly started feeling like Perth was not for me anymore. I felt like I’d done everything I need to do here and to stay for longer would just be a long wait for when I could finally leave. So I’m going back to Melbourne for two weeks! I am not a very spontaneous person, but I do have a very strong sense of what I do and do not want. And I do not want to stay here any longer. It’s a bit silly because I already have tickets to Cairns booked from here, and plans on my last day, so I ended up having to come back to Perth again rather than just flying straight from Melbourne. I still feel like it’s a small price to pay for greater happiness. And it will give me another chance to catch up with people that I didn’t get to say goodbye to properly! Also, in the vein of my last post… Madame K’s every day. One of the good things about Melbourne is that there’s a pretty good variety of vegetarian restaurants. I rarely bother going out to a nice restaurant unless it’s vegetarian – depending on country, you might have one to three choices that are meat free, and one of them will invariably be a boring salad. The second one is usually pasta with red sauce and three pieces of vegetable. Luckily, Melbourne has heaps of good veggie restaurants, and that’s one of the things I will definitely miss the most about it! When I die, bury me at Madame K’s. They have the most DELICIOUS tofu on the planet. 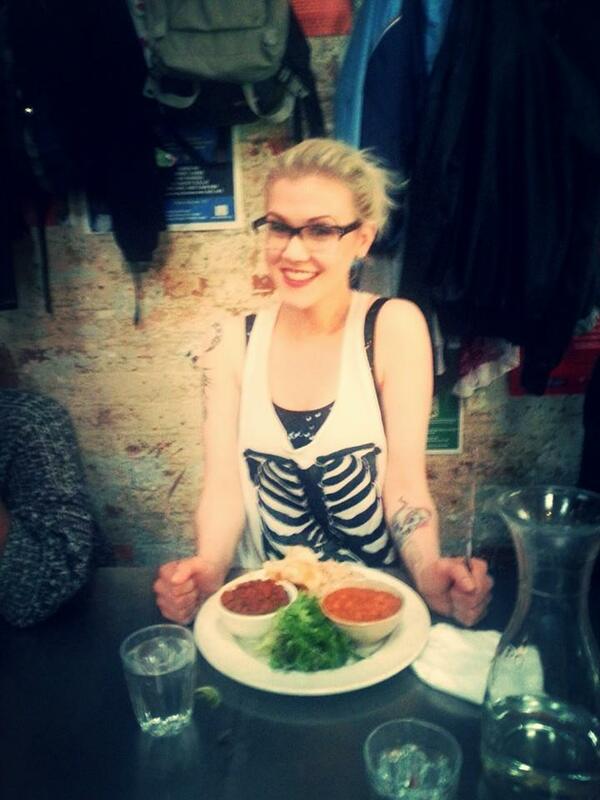 I would literally get on a plane right now and go to Melbourne overnight just for a chance to eat here again. Without question, this is one of the best restaurants I have eaten at ever. I think a lot of their clientele is people who come in because Veggie Bar was too full and it’s the closest veggie restaurant (just across the street), but I can’t imagine anyone ever regretted it. Most of the food here is Thai or Thai inspired, and it is all cooked to perfection. I’m actually feeling a bit weepy just thinking about it. This is one of the most popular restaurants in Melbourne, full stop! I downloaded a travel guide to Melbourne, and they listed this as one of the five best restaurants in Melbourne (it was the only veggie restaurant to be included on the list). I do like it, and one of the things that might push it into the top spot over Madame K’s for other people is that it has a lot more variety when it comes to cuisine. If you want Asian food, Madame K’s wins easily, but if you’re out with people who are not so keen, and would rather have a burger or some other type of western food (which is your problem, really, why are you even friends with them?) Veggie Bar might be a better alternative. The biggest downside is that because it’s so popular, if you get there after 6.30 on a weekend, you will be waiting for a table for at least half an hour. I’ve never actually braved the wait because I know there is a slice of heaven waiting for me just across the street, so I can’t tell you if their prediction is accurate or not. Well worth a visit, but get there early! This is barely a restaurant, to be honest, but it is probably the place where I’ve had the most meals in Melbourne (including my own flat). It’s a bit of a hole in the wall on Chapel street, and many people would probably pass it by, but they do not know what they are missing out on! The food here is delicious, cheap and filling, and if I was just out for lunch this would definitely be my first choice, always. So I went to Perth! It was a bit willy-nilly, I suppose. I wanted to see a bit more of Australia, and I have a friend here, so I thought I would give it a go. My first impression of this city was that it was almost like an amusement park; small and delightful and the streets smell like popcorn! I quickly figured out that that is only because I am staying in the arty part of town, and there’s a San Churro down the street. I’ve been amusing myself by going to the botanical gardens, which are absolutely beautiful and well worth a visit. My slightly updated view of this city is that it’s a lot smaller than Melbourne, and there’s a lot more homeless people here. Street harassment seems to be a thing a lot more than it is in Melbourne, unfortunately, but during my time in Melbourne I have realised that it is a safe haven for women. I think I would not need more than at least both my hands and feet to count the times I’ve been sexually harassed on the street in Melbourne – and yes, I realise that is a sad thing to say, but if you compare and contrast to London, for example, where it will happen maybe sixteen times every time you leave the house, it seems like it’s not so bad. Anyway, back to Perth. I’ve got another two weeks here, and I intend to make the most of that. I haven’t been to the beach yet, so I’m going there as soon as I can. I just have to find a day where I have the motivation, the weather is right, and I don’t have plans that night. Because I am the type of person who can do one thing only in a day.